Slice the pork diagonally across the grain into strips approximately 1/3 inch thick, 1 inch wide, and 3 inches long. Set aside. Combine the lemongrass, garlic, oyster sauce, sugar, and pepper in a large ziplock bag. Seal the bag and toss it back and forth to combine. Add the pork strips, seal and toss the bag back and forth several times to coat the pork strips and the marinade. Refrigerate for at least 1 hour, or, for best result, overnight. Prepare the grill. While waiting for the grill to get hot, remove the pork from the refrigerator. 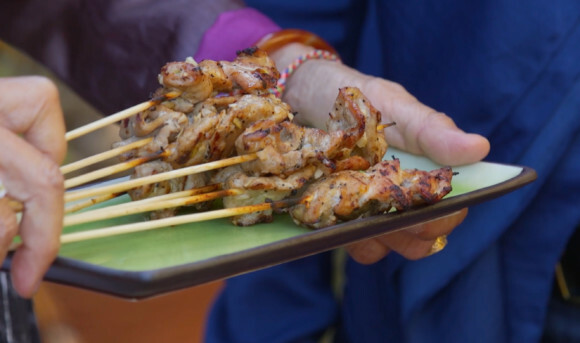 Thread a piece of pork lengthwise onto a skewer, keeping it flat. Add 1 to 2 or more of the pork to the skewer. Repeat with the remaining pork. Transfer the remaining marinade to a bowl and add the pineapple juice. Mix well and set aside. Generously spray the pork with coconut oil spray. Lay the skewers on the grill over medium- high heat, arranging them close together. Grill, basting with the marinade and flipping frequently, until the outer sides are slightly charred and the pork is firm to the touch; cook for 3 to 4 minutes. Transfer to a platter and serve.